The Democratic Party frontrunner appeared poised during a gaffe-free first half of Thursday's congressional inquiry. Hillary Rodham Clinton didn’t back down before a combative and impatient congressional committee during her Benghazi testimony Thursday morning. 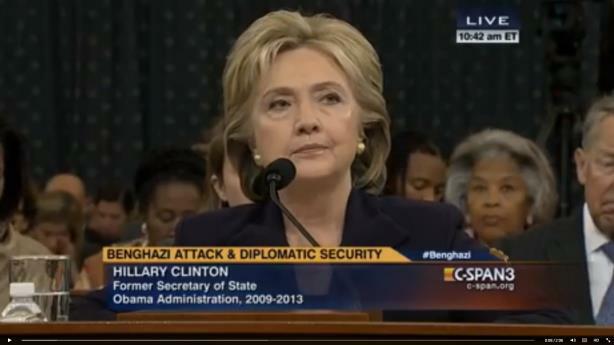 The former secretary of state emphasized that she has been accountable for the attack on the US consulate in Benghazi, Libya, in which four Americans were killed on September 11, 2012. "I take full responsibility for what happened in Benghazi," the White House hopeful said. Clinton maintained a measured tone throughout her testimony and undercut the partisan division in the room, calling for Congress to be a "partner." That term echoed unrelated comments by Vice President Joe Biden on Wednesday when he said he would not run for president. (Need a refresher on Benghazi? Vox has the lowdown). A majority of Americans see the Benghazi investigation as a political maneuver, according to a poll from CNN, which found that 72% of respondents believe it is using the investigation for political gain. There was considerable back and forth over the Democratic frontrunner’s private email issues. Clinton, likely accustomed to hearing about her own messages by now, was not fazed by the latest reminder of her correspondences – or snide remarks about her notes, for that matter. Your call - Should Joe Biden run for president?